October moves us toward completion slowly but surely! Work continues steadily this month. The plumbing ‘rough-in’ has been completed and Tere prepares to do the electrical rough-in, seeking advisement and supplies, drawing out the plan for the ‘panel.’ Meanwhile Sarah has been steadily laying the twice-recycled floor boards in the main room. Now THIS is GREEN BUILDING at its finest! These boards were purchased last spring from a guy who salvages and re-sells lumber. They were originally part of a warehouse floor in Seattle. We used them initially to make forms for our foundation. Since then, they’ve been sorted and cleaned and now being laid for the floor! 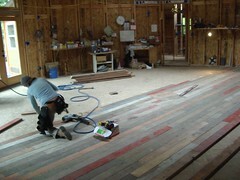 Several people really like the colors and textures of the wood, but we DO plan to sand and re-finish it. We’re buying salvaged wood for the walls too–Jeff just brought it today. Considering how much we cherish our forests, it feels really good to avoid using more virgin timber for this house. (for more photos click here.) With my right hand still a bit ‘lame’ (tendonitis? Carpal tunnel syndrome?) I’ve been busy on the computer researching appliances through Consumer Reports. OH MY! !–there is so much to learn! Last week Tere and I went into Seattle to a lighting store–another OH MY!! It looks like we could spend $5000-7000 on basic lights if we aren’t careful. There are thousands of choices–how to decide!!?? Appliances are like that too, but consumer reports offers good information to help sort through the options. THANK GOD for that good service! We’re hoping to complete the electrical rough-in within a week or so because the insulation is scheduled to be ‘blown in’ next week. The gutters will be installed next week too (none-too-soon!! We’ve already had some heavy rains resulting in mud and puddles all around). I could tell you a funny story about our failed attempts to install our first toilet last Saturday, which resulted in water spurting straight up to the ceiling unexpectedly! Imagine me trying to hold back the geyser by standing on a crumpled blanket on top of the leak that was ineffectively plugged with plumbers putty while Tere ran all over trying to figure out what to do! It was “one of those moments….”, pretty humorous actually. But we had it figured out and cleaned up within a half hour–not too bad! But we STILL don’t have a toilet….. We ARE looking forward to using that $30K septic system someday soon!! This entry was posted in News on October 22, 2007 by theresecharvet.